Car technology continues to move closer to self-driving cars. And with each advancement, the promise of a future free from car accidents seems possible. But what happens when such systems fail? What if a self-driving car causes an accident? Who’s legally responsible for financially compensating accident victims for their damages and injuries? Such questions came to the forefront recently in response to an investigation of fatal car accident involving a self-driving car. On May 7, an Ohio driver was killed in Florida when his Tesla Model S crashed while being operated using the car’s autopilot system. The car drove in front of a tractor-trailer, which crashed into the car, killing the car’s driver, according to The New York Times. Recently, the National Highway Traffic Safety Administration (NHTSA) closed its investigation of last year’s deadly car accident. Investigators ruled the accident was not caused by a defect and that the vehicles did not need to be recalled, according to The Los Angeles Times. Specifically, the NHTSA ruled that the vehicle’s autonomous driving system worked as designed and that the company should not be held responsible for the accident. Can car companies be held responsible for self-driving auto accidents? The NHTSA’s finding seems to let auto makers off the hook for accidents involving self-driving cars. But like other car crashes, not all motor vehicle accidents involving self-driving vehicles are the same. 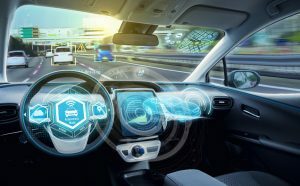 As a result, car companies could potentially be held responsible for future self-driving car accidents, especially if the accidents involve defective product liability claims. Specifically, Tesla’s self-driving software has been effective at preventing rear-end car accidents, Thomas said. However, situations involving crossing traffic “are beyond the performance capabilities of the system,” Thomas said. In addition, in the case of last year’s fatal Tesla car accident, investigators determined that the driver “was not paying attention to the road,” The New York Times reported. Tesla has said the accident occurred because the vehicle’s camera “failed to recognize the white truck against a bright sky,” according to The New York Times. As a result, even though the car’s self-driving system was not found to have been at fault for this accident, the investigation leaves the door open to the possibility of future legal cases involving self-driving car accidents. This means that autopilot systems – and thus their manufacturers – could potentially be held liable for future self-driving car accidents. What are possible product liability cases involving self-driving cars? These are just some of the ways accidents involving self-driving cars could occur. Car accidents can happen any time for a wide range of reasons. And in each case, the person or company responsible for such accidents should be held accountable for their actions. Otherwise, similar accidents could occur in the future. And as our Oregon auto accident attorneys can tell you, no one ever wants to be in a serious motor vehicle accident.